Tired of inaccurate weather predictions from your smartphone weather apps or commercial weather stations? Two years ago, I was in the same state as you. All my outdoor plans would get ruined simply because I relied on the weather apps. Reality then hit me that these apps were feeding me with data from stations based miles away and they weren’t gonna give me 100% accurate reports. “That sounds great!” I told her. And in the next few minutes, we were on the laptop researching the best weather stations. We finally settled on one model (a budget conscious one) and placed an order. Fast forward, my story has completed changed. Now, I’m always ahead of Mother Nature and can easily tell her next move (weather patterns, you know). The two years I’ve been using my personal station has been a great learning experience for these units. I’ve crafted this mega-guide to teach you everything you need to know about the home-based weather stations— how the work, how you can easily choose the best model for you, and so much more. BONUS: With my sister’s help, I also compiled 13 highly reliable, accurate home weather station reviews that I’ll also share with you below. Why Buy a Weather Station? It’s true that the weather controls a large part of our lives or day to day activities. While there are many sources of weather forecast reports out there— e.g., your favorite channel, smartphone weather app, county weatherman, etc. — none of them can beat a personal weather station for home. You install the weather station in your home area. This will enable it to give you more accurate results that are specific to your area compared to other alternatives that rely on reports of stations far away from your home. In simpler words, installing a weather station at your home will provide you with weather reports that are specific to your area, or the area where your kids play, where you hold your barbecues, or in your garden or farm. With a home based weather station, you’ll be getting real-time weather reports that will let you successfully plan for each and every activity. You’ll also join thousands of folks who share data from their home weather stations. Believe you me; this will make the weather forecast reports more accurate for everyone. And if you’ve got kids like me, your personal station can be a great learning opportunity for them on how the weather works. (Who knows, they might develop a passion for meteorology!) Also, there are kids weather stations available too! This section contains the 13 most popular weather stations that you’ll find installed in most homes. When making the selection, we focused on the pocket-friendly models with most of the top-end features and unmatched performance. We kick off our reviews with the Ambient Weather WS-2902 10-in-1 Wi-Fi Professional Weather Station. Ambient Weather is a trusted name in the home weather station field for its top-quality and highly reliable products. We loved this particular Ambient Weather model because of its affordability, reliability, and accuracy. It comes fully dedicated to helping you monitor a broad range of your backyard weather conditions. These conditions include wind speed and direction, outdoor humidity and temperature, rainfall, solar radiation and UV, indoor temperature and humidity, barometric pressure, wind chill, heat index, and dew point. The station provides you with real-time weather reports (updated every 16 seconds) which you can access on a large, easy to read LCD monitor. It comes integrated with a solar panel which acts as its primary source of power. The panel will charge a super-capacitor which will then power the unit. And in case the solar energy gets depleted, you can use batteries as a backup power source. Since the station has wifi connectivity, it lets you easily connect it with large weather networks such as Weather Underground, Ambient Weather Network, Weather Bug, etc. This means you can remotely view real-time as well as historic weather conditions from your computer, tablet or phone— anytime, anywhere! Even better, you can also connect this station with Amazon Axela or Google Assistant. When connected, you can ask these devices the current indoor or outdoor weather reports at your home and receive your own local weather report. Besides, the unit is also compatible with IFTTT, allowing you to control a wide range of smart devices around your home with auto triggers. Again, Ambient Weather WS-2902 10-in-1 Wi-Fi Professional Weather Station is the best station that offers real value for money! I personally love AcuRite products because they’re highly innovative and easy on your wallet. The brand’s reputation in the weather industry is undeniable. In our second spot, we feature the AcuRite 01036M Wireless Weather Station. This is a high precision weather station that provides you with accurate information on the weather condition in and around your home— such as rainfall, wind speed and direction, humidity, and outdoor temperature. Setting up the unit for use is extremely easy because all the sensors are fixed into 1 sensor (5-in-1 design). This saves you the hassle of separately installing the various sensors separately. The system also comes with PC connect feature, where it lets you effortlessly transmit all your weather reports to your Windows PC for sharing, storage or analysis. Like our previous model, it also allows you to remotely access the weather reports via the internet (via smartphone, tablet or computer). It presents you with an illuminated color LCD display where you can easily view all the information. We also couldn’t help noticing how fast this station updates data. It updates wind speed every 18 seconds, wind direction in 30 seconds, and humidity and temperature in 36 seconds. As for the power source, the wireless station utilizes either lithium batteries (not included) or 4 AA alkaline batteries. Overall, if you’re looking for an incredibly accurate and reliable weather station at an affordable cost, you can’t go wrong with this weather station. Davis Instruments 6250 Vantage is the best weather station for those looking for a wireless weather station that’s easy and quick to install. This is made possible by its all-in-one sensor suite and the included mounting hardware. Far from installation, this station is also known for its incredible performance. It reports a broad range of weather conditions, including rainfall, indoor/outdoor temperature, barometric pressure, humidity, wind speed and direction, and dew point. Remember you’ll be accessing all your weather reports on a large, easy to read, backlit LCD display. The glow in the dark keypad means that you can even use the data console in poorly lit conditions. The wireless station comes with a longer transmission distance of up to 100-yard compared to most of the wireless stations out there. And like all the other systems from Davis Instruments, the station offers you weather updates after every 2.5 seconds to keep you alert to the changing weather. Additional features and functions you might find useful in this weather station include forecasting, sunrise/sunset times, moon phase, weather trends graphing, alarms, and many more. For the ultimate durability and longevity, the system comes with a corrosion resistant and durable weatherproof cover. All the electronics are also over-molded or potted for moisture shielding purpose. La Crosse Technology has also won the hearts of many homeowners with its list of incredibly affordable (the cheapest you can get on the market), performance-oriented weather stations. The station features a weather resistant sensor that collects and transmit the indoor and outdoor temperature and humidity to an easy to read, full-color LCD display with adjustable brightness. The station will also provide you with dew point and heat index recordings. Unlike most of the low-end models out there, this station goes a step further to provide you with low and high temperature alert settings as well as min and max humidity alerts, to let you plan your day even better. The sensors utilize 2 AA batteries which are included in the package. The display has battery level indicator for your own convenience. For backup power loss, you can use 3 AAA alkaline batteries. Something else we loved about this station is forecast function which will give you a personal an accurate personal forecast of your location. Doubtlessly, this will help you plan your future better. Additional features include a self-set atomic date and time auto DST updates. Remember that La Crosse Technology C85845 is one of the most affordable models not only on our list but also on the market. It’s the best deal for folks on a super-tight budget. If all you need is a weather station that provides you with super-accurate Humidity, Temperature, and Wind speed readings, then AcuRite 00589 Pro is your perfect choice. In addition to these three main parameters, the station also records wind chill, heat index, and barometric pressure. Featuring a crazily low price, this station also features a patented Self-calibrating technology. This provides you with a personal 12-24 hrs forecast of your local weather conditions. Because the forecasting is generated using the weather data collected by the sensors, you can rest assured that you’ll get the most accurate weather forecasts for your exact location. Just like in our previous station, this AcuRite also comes with an illuminated color LCD display. It features up to 3 light settings to help you set your comfortable light level for easily reading the generated weather reports. Installing this system is the easiest part. All the mounting hardware is included in the package. Because the battery has a 2-year lifespan, this system is also maintenance free. And for the jittery customers, the unit comes with a 1-year limited warranty as an assurance of quality and reliability. Our 6th best wireless weather station spot goes to the AcuRite 02064 Wireless Weather Station. This particular model comes with a 5-in-1 sensor that records data in the exact location your install it in with pinpoint accuracy. You can rely on it to provide you with accurate readings of various weather conditions like rainfall, indoor/outdoor humidity and temperature, wind speed and direction, wind chill, heat index, barometric pressure, dew point, date and time, and even weather forecast. It also features an illuminated color display. I honestly love the fact that this display can stand upright to let you use it as a tabletop, or you can opt to mount it to the wall. Doesn’t this make it convenient to use? Similar to its cousin (AcuRite 01036M), this AcuRite 02064 also comes with PC connect feature. This is a pretty convenient feature for you because you can upload all your data to your Windows PC and share it, analyze it or simply store it. What’s more, you can also remotely access your station data online— on My AcuRite iOS/Android app. Just like most of the top-end weather station, this AcuRite also provides you with 12-24 hours personal weather forecasts of local weather conditions. The system is powered by a 4.5V power adapter (included) or 3 AA alkaline batteries (not included). Ambient Weather WS-1201-IP Observer combines reliability, accuracy, and wireless technology to keep you updated about your home backyard weather conditions. The fact that it offers you most of the high-end features at a reasonable cost won it a place on this list. The first thing we noticed about this system is the all-in-one sensor array it comes with. This enables it to record a broad range of weather conditions like humidity, rainfall, temperature, wind speed and direction, dew point, heat index, UV and Solar radiation. It also doubles as a reliable indoor weather station that record accurate indoor humidity, temperature, and barometric pressure. Because the sensor updates frequently (after every 14 seconds), you’ll never miss a wind gust! The unit has an easy to read full-color LCD display lets you easily access all the above data regarding weather conditions. The display brightness changes automatically at different times of the day. We also liked the fact that this station offers you extra data sunrise/sunset, moon phase, historical achieved data, detailed time weather trend graphs, to name but a few. The best part about this top-rated weather station is that it’s 100% compatible with Amazon Axela and Google Assistant, enabling you to get real-time or past weather reports from any place. You can also connect the station to IFTTT and enjoy controlling your various home devices (e.g., rain gauges, blinds, lights, switches, etc.) even when you’re far from home. If style matters to you, then Netatmo Indoor Outdoor Weather Station can be an excellent choice. The station boats of an elegant French design which makes it a stylish addition to your home. On top of this, it comes at a fair cost to match your budget needs. Now, let me make it clear that Netatmo isn’t really a weather station manufacturer. Instead, it’s a smart device manufacturing company. This explains why this particular weather station is unique from the other models. We noted that the station comes with a set of unique sensors that let you keep track of your indoor as well as outdoor weather conditions. It collects a broad range of data such as temperature, humidity, barometric pressure, and CO2 concentrations. Thanks to its connectivity capabilities, the station will send you the recorded data directly to your smartphone for easy access anytime, anywhere. The CO2 sensor, in particular, is a useful feature for all homeowners— it lets you know when to air home to keep it fresh and safe for you and your family. Since it also features IFTTT compatibility, you can easily link it to other smart devices around your home. This will make it possible for you to control various things in your home based on the data provided by the station. Overall, if you’re looking for the best indoor/outdoor weather station with internet connectivity and good looks, Netatmo Indoor Outdoor Weather Station is a solid option. Oregon Scientific is one of the top manufacturers of top-of-the-line weather instruments. In our 9th spot of the best personal weather station reviews, we feature their one of their most affordable model with solid features—the WMR86NS Complete Home Weather Station. Packed as a complete weather station, this model lets you get accurate info on the weather inside your house as well as in the backyard. It gives you data readings for humidity, wind speed, wind direction, wind chill, barometric pressure, and rainfall. Not only that, it gives you indoor temperature and humidity readings, and even moon phase data. Like all the weather stations we’ve featured on this list, it also presents you with an easy to read, backlit color LCD display. The sensors are powered by 2 AA batteries (included) while the data unit uses an AC power adapter or 3 AA batteries as backup power sources (also included). WELQUIC Digital Wireless Weather Station is the most affordable model we come across on the market. But don’t let the low cost mislead you; this unit is also capable of meeting all your basic indoor/outdoor weather prediction needs. It measures multiple weather conditions accurately. You can use it as a thermometer, barometer, hygrometer, and alarm clock. It provides you with the most accurate weather forecasts. The display unit features an incredibly large color LCD display for easy viewing of all your station data. You can opt to place this console in base stand position or hang it on the wall. Keep in mind it also has up to 3 brightness settings to ensure comfortable viewing. You’ll find the alarm and snooze function helpful as it helps you set the system to alert you when various weather conditions are reached. Unfortunately, this system comes with a lower transmission range of up to 30m (98 feet). But we believe it’ll still work for most homes. A super versatile station that can serve many purposes, e.g., hygrometer, thermometer, etc. We loved this AcuRite home weather station because it not only offers you reports on various weather conditions in your backyard but also keeps you updated on lightning storm activity (up to 25 miles)— ensuring lightning safety. It’s vivid High-definition display that delivers vital information about weather condition at a glance. The screen displays humidity, temperature wind speed and direction, rainfall and lightning data, all transmitted by the pro 5-in-1 sensor. You’ll surely love how easy this screen lets you toggle between indoor weather, outdoor weather, and daily records for each weather parameter. Thanks to the customizable alarms, you can set this unit to alert you when different conditions reach a specific value. The pro weather station also comes with integrated solar panels. These power the internal aspirating fan, thereby maximizing ambient temperature accuracy throughout the day. With the included mounting hardware and brackets, installing this system becomes easy and fast. The automatic self-emptying rain gauge adds to the convenience of this unit. The transmission range is pretty long (at 330 ft.). The unit transmits data after every 18-36 seconds. Best of all, the entire weather station is building using durable, all-weather materials for an extended lifespan. Customizable alarms for wind speed, temperature, rainfall, etc. If you’re all about monitoring rainfall, we recommend you to go with this Weathermatic Wired On-Site Weather Station. The station comes equipped with rain and freezing sensing to help prevent watering during rain and freezing weather periods. It features a rain shut-off feature that helps stop watering when the set amount of rain is received (you can set this function from1/8 - 3/4"). The freeze shut-off, on the other hand, prevents watering when the outdoor temperature gets below 37 degrees F (or 1.5 Degree Celsius). Watering can resume later when the temperature rises above the 37 degrees F mark. You’ll appreciate the fact that this station is designed for use for countless years without any maintenance. It doesn’t utilize any onboard power source. As the operation power comes from the controller. The unit also features a reasonable transmission distance of up to 200’. If you wish to install the unit at greater distances, the manufacturer recommends you to utilize the Slw15 or Slw10 weather stations. Rain shut-off can be set from 1/8 - 3/4"
The last home weather station on our list is the La Crosse Technology WS-2317 Professional Weather Station. Similar to the La Crosse Technology model we discussed earlier, WS-2317 Professional Weather is also a high-quality system that accurately reads, processes, and displays data of all weather conditions. It features 3 outdoor sensors that transmit data through a connected wire or wirelessly (using a 433MHz frequency signal). The weather conditions reports you’ll get when using this station include rainfall, indoor/outdoor temperature and humidity, wind speed and direction, dew point, barometric pressure, and wind chill. In addition to the main reports, it also provides you with extensive weather data such for all conditions with programmable alarm functions, for specific weather conditions, etc. it even records the min and max values alongside date and time of these recordings. All the above weather information is displayed in a large, user-friendly LCD where you can easily view it and get to plan your activities. We also liked the PC interface function included in this system as it lets you conveniently keep track of the weather information through your computer. Talking from experience, getting the perfect personal weather station can be a daunting task. I remember the hassle Olivia (that’s my sister’s name) and I went through before we could finally settle on one station. We had to sort out thousands of models with different shapes, sizes, features, etc. before we could get a suitable station. Lucky for you, I’ve outlined the most important factors and considerations that will help you easily get the right weather station for you. Why are you buying a weather station? The very first thing you need to do when looking for a weather station is defining the purpose it’ll serve (or what you intend to do with the collected data). If you simply want something to tell you the climatic conditions in your backyard, then nearly any model will do. What if you want to use your station for other purposes like studying, farming, camping, etc.? In such cases you’d want to look for more specific models that carry all the features to help meet your specific needs. In addition to that, you’d want to check if the station is portable or home-based. The former is usually smaller an easy to use, making it ideal for hunters and campers. The former can be a great choice for weather professionals, farmers, or gardeners. As a beginner, you might not know this, but weather stations come in different designs. Thus, it’s crucial that you decide the type that’s most suitable for you. That said, the two most common types of weather stations you’ll find on the market include the wired and wireless models. Wired station: this is the oldest model, and it involves instruments being wired together to send information. Since the wires and placement ought to be installed correctly, this type of station will require a lot of time and effort to set up. Wireless station: regarded as the modern type, this type of station utilizes sensors and other advanced technologies, eliminating the need wires to connect different equipments in order to correct data. For this reason, a wireless station is easier to install. You’d also want to check the type of data the home weather station you buy collects and if it suits your needs. Nearly all the weather station you’ll find on the market will provide you with basic weather data— like temperature, humidity, barometric pressure, precipitation, wind speed and direction, and daily and yearly rainfall. These are more than enough for an average weather station, right? BUT…there are some high-end models that go beyond this list and provide you with even more weather conditions data such as additional wind speed and rainfall reports, apparent temperature, solar and UV radiation, soil moisture and temperature, evaporation, transpiration, leaf wetness, etc. Where possible, I’d recommend you to choose a model that comes with as many sensors as possible. The main reason you’re buying a weather station is that you can’t rely on the smartphone apps and other weathermen reports. So, there’s no debate on whether you should invest in an accurate weather station or not. The secret to getting a highly accurate personal weather station lays in looking for a model built with high-quality sensors. If you’re not watchful, you might end up with a station that over or undercounts rainfall, gets affected by sun exposure, etc. NOTE that some manufacturers tend to sacrifice quality of materials and accuracy to give you affordable models. This means that you also need to be careful about buying just any cheap model you come across. An excellent way to know the accuracy level of a station is checking what the previous users had to say about the specific station you’re eyeing. Trust me; you’ll get firsthand info here that will save you from disappointments and frustrations. In my honest opinion, the station should serve a primary role in keeping you with up to date with the surrounding weather conditions to help you make better plans, as the weather keeps on changing. It, therefore, goes without saying that the frequency at which a station provides you with weather data is also an important consideration when making a purchase. A good weather station should provide you with data for highly variable conditions (like wind speed and direction) every 2-3 seconds. It should keep you up to date with data for less variable conditions (like temperature or humidity) in a period ranging from 30 seconds to 3 minutes. I’ll be frank with you: some weather stations can be a REAL headache to install! If you come across a model with fully assembled equipments and ready for mounting, I strongly suggest that you go for it without a second thought. In addition to that, check that the model is extremely easy to set up in general, has a high flexibility reading mounting, and even offers you multiple mounting options. A model that comes with simple and clear installation directions is also an added advantage for ease of installation. Besides installation, a good station should also be easy for you to run. It should come with user-friendly desktop console or app. The maximum transmission distance is also a key determinant in your search for the perfect weather station for your home. That said, the transmission range varies from depending on the structure of the land as well as the surrounding physical settings. RF interference can also affect distance. Go for the wireless stations that come with a broader transmission range (most units claim to offer you 200-250m in a clear line of sight). Also, they should also come with wireless repeaters which can further extend the provided optimal range (probably over 1km!). Let’s have a word about wired models and the transmission distance…most models come with thin ribbon wire for connecting the station to the console. The length of this wire is around 30m. However, you can extend it all the way up to a maximum of 300m. However, installing the wire might require a lot of labor. You might also need to add special conduits to the wire for extra protection. Not to forget the thin cables are prone to damage. Given the longer reception range of the wireless models, I recommend you to consider them in place of wired stations. If you want your unit to serve you for a longer period and give you the real value for your buck, then you should ensure it’s made of quality and durable materials. Keep in mind that you’ll be installing your new model out there, where it’ll face all kinds of elements through the year, including rain and snow and hot and cold weathers. Cheaper models tend to feature cheap materials, e.g., plastic, construction that will become brittle over time due to extreme weather conditions. And this will definitely send you back to the stores looking for a new model. If you want a long-lasting station, be sure to check the quality of materials and resist the urge to get attracted by the insanely low priced models. All the weather stations we picked for you in the reviews above will offer you long-lasting service at affordable costs! How your new station is going to be powered should also help you determine the ideal model for you. You’ll find some wired models that use AC power, which is utterly convenient for such models. Others come with AA batteries which are also ok.
Then some models come with solar panels to collect the solar energy. If you live (or plan to install your station) in areas with unreliable electricity, then I suggest you buy this model. Getting a model that works with various voltage sources is a brilliant idea to ensure you’ve many alternatives when the main option becomes inconvenient to use. Different weather stations come with different costs. This can present you with a challenge when choosing the perfect model for you. That’s why I recommend you to keep your budget in mind when making a selection. When setting your budget, consider the factors you want in a station. You don’t expect a low-cost model to offer you all the features you want. As you climb higher in the price ladder, you’ll get high-end models with even more features and functionalities. For the folks working on a tight budget, you should focus on getting a station that offers you most of your desired features and functions at your budget range. And if you’ve got cash to spend, why not go for the higher-end models with all the features you need? Does the station come with a Warranty? A good quality personal weather station should also come with a warranty. This will give you peace of mind knowing that your new investment will not disappoint you. And if it gets faulty along the way (as it’s possible of any other machine or device), you’ll have an option of either asking for repair/replacement or refund, depending on the warranty terms. Recording of Highs and Lows: some station record highs and lows measurements which are displayed digitally or numerically on the screen. Such models are a great choice. Expandability: because human being needs tend to change with time, go for an upgradable model that lets you easily add more sensors as your needs change or grow. Alarm: some models come with alarms that alert you about to certain changes in weather conditions. You can set these alarms, or they can be automatic. Some models will even offer you different alarms for different weather conditions. Weather forecast: though not an essential factor, getting a model that generates weather forecast will help you easily plan your day or activities. Size and weight: chose the size of a weather station according to the available space. And in case you’re looking for a portable model, make sure it’s also lightweight for easy carry. Wired vs. Wireless Weather Station For Home Use? As I told you earlier, home weather stations come in two main types— the wired/cabled and wireless weather station. Each of the two models comes with its own set of upsides and downsides, and the ideal type for installing at your home depends on your specific needs. The wired model involves a set of cables from all the sensors of the weather station to the data console. There’s a lot of work involved in setting up the station as it will require you to run the cables through yards, drill through holes, etc. One thing you’ll love about the wired station is that there’s no RF or RFI interference. You don’t have to worry about possible signal loss associated with obstructions such as trees, buildings, hills, etc. The most important thing to keep in mind when using a cable weather station is the possibility of a lightning strike. For this reason, you’d want to install a lightning arrestor that helps minimize the chances of the lighting striking getting transferred to your house and causing massive damages. As long as you install your wired station correctly, it’ll work safely; if not sure, don’t hesitate to consult a licensed electrician to ensure you’re 100% safe. On the other hand, a wireless station does not employ any cables. This means that installing this type of station is extremely easy and quick for you as you don’t have to figure which cable goes where. Maintaining this station is also quite easy as you don’t have to worry about wires getting easily damage or cut as it’s the case with wired models. The system comes with sensors that collect all the required data and sending it to your console via waves. For this reason, a wireless station might get affected by RF or RFI interference. This will result in signal loss and affect the quality of weather reports you receive. A typical wireless station offers you up to 250m transmission range, which you can extend to even greater distances with the help of repeaters. Also, the station will experience signal losses if its line of sight isn’t clear (or if it passes through obstructions/solid objects, e.g., hills, building, and trees). It’s worth noting that wired stations are generally more expensive than the wireless ones, so you’ve to pay the extra bucks if you go with this type. In summary, I’d recommend you to go for a wireless weather station or wifi weather station. This model is preferred by many homeowners due to its ease of installation, and ease of maintenance. The wired models are more suitable for businesses that depend on the weather conditions as there are no chances of the RF corrupting the signals being transferred. Internet Monitoring Option: How Important Is This Feature? Times (and technology) are changing pretty fast. And today, it’s possible to access the weather conditions recorded by your weather station while on the go— thanks to the Internet Monitoring Option function. You can do this via your laptop, tablet, or even smartphone! This feature is present in the wireless weather stations. The station will measure the rainfall, wind speed, wind direction, indoor/outdoor temperature, indoor/outdoor humidity, solar radiation and UV, etc. It then transmits all the data to a given app or website where you can access them even when you’re far away from home/station. Most of these modes will also let you upload the data to websites such as WeatherUnderground.com, WeatherLink.com, WeatherForYou.com, etc., for comparison purposes. Trust me; meteorologists will find this data quite helpful (especially if you live in areas where they don’t have a station). And yes, with the emerging smart home technology, you can not only monitor your station from a remote location, but you’ll also make your desired changes, like adjusting the various conditions to your preferred settings. A good example involves the weather station ability to connect to IFTTT— a web-based app that initiates actions that you’ve chosen such as turning on your home ventilator fan if humidity hits a certain value. While still on it, you can include an IP camera to your weather station to provide you with real-time visual snapshots of weather conditions regardless of your location. Personally, I haven’t added a webcam to my station set up but I’ve come across many homeowners who have successfully done it. As long as your system has internet/Wi-Fi connectivity, you can remotely access images or videos (in addition to the weather reports) over the web by connecting to your mobile device. Though the Internet Monitoring Option is not an essential feature to have in your home weather station, it is truly convenient for all homeowners. If you can afford a station this feature, go for it! Indoor vs Outdoor Weather Station: Where They Differ? An indoor weather station is specially designed for predicting climatic conditions in and around your house. The outdoor station helps you predict the outside weather conditions. The indoor model comes with a variety of sensors that helps you easily predict various indoor weather conditions. It can even allow you to measure the temperature and humidity if each and every room in your house, to help you make the necessary changes. Some indoor stations even come with advanced functions like self-adjusting atomic clocks, so they can easily make your preferred changes automatically. These models find great use by parents who wish to monitor various indoor conditions for their babies. They’re also widely used in baby nurseries, detached greenhouses, libraries, garages, laundry rooms, wine cellars, attic, among other places. It’s also possible to find an indoor weather station in a construction site! The outdoor model also comes with a broad range of sensors that provide you accurate weather predictions. Each sensor is attached to each instrument to help you collect all the data you need—including outdoor temperature, humidity, rainfall, barometric pressure, wind speed and direction. Some modern models can even provide you with additional data such as UV and solar radiation, leaf moisture, soil moisture, etc. For the outdoor models, the sensors are placed outdoors (in an open area, free of obstructions). These sensors will then collect data and send it to a monitor or data console- either via wires or wirelessly. You can expect to find an outdoor weather station in many places such as backyard of homes, farms, recreational vehicles, schools and classrooms, golf courses, businesses, emergency monitoring, industrial applications, resorts, etc. You can find them basically anywhere! It’s worth noting that most of the models you’ll find on the market today perform as both indoor and outdoor weather stations. In other words, they come fitted with both the indoor and outdoor weather measuring sensors. In fact, most of our personal weather station reviews above cover such models. I suggest that you invest in such models as they’ll let you monitor the weather conditions not only outside your house but also indoors. What Type Of Weather Station For Rv Is Perfect? This is for the outdoor enthusiasts or RVers in the house! As you’ll all agree with me, how you enjoy your travels and outdoor adventures heavily depend on the weather. Luckily, you can install a weather station on your RV to help you get up-to-the-minute updates on the weather conditions around you. The station will help you stay ahead of the weather so that you enjoy all your activities out there as well as keep safe, regardless of your destination. Firstly, the perfect weather station for RV should be wireless. Locating and installing such a model will much easier for you compared to the wired model where you’ll have to deal with cables. The weather station should also carry all the basic weather measuring instruments. This isn’t a problem as all the models you’ll find on the market today can measure temperature, humidity, barometric pressure, wind speed and direction, etc. Keeping in mind that this is a model you’ll take with you out there, you’d also want to ensure it has a portable design. That is, it ought to be lightweight and compact (the last thing you want is a weather station that adds bulkiness to your RV). Concerning the power source, I urge you to look for a station that comes with an integrated solar panel. This will ensure you can use the naturally available solar energy and save yourself the hassle of replacing batteries. The best RV weather station should also give you an easy time installing and setting it up on your track. Most stations come with all the weather instruments mounted on a tripod which you just attach to your home roof. The tripod is usually collapsible, and you can as well fit it on your RV roof plate with the help of a pin and simple guy-wire. The installation method isn’t very convenient for RV, though. The temperature sensor was placed underneath the RV (though, you can set it anywhere else far from direct sunlight). How to install the station is entirely up to you. See the video below on simple weather station for RV installation. Other factors that make a great weather station for your RV include the internet connectivity function. This, in my view, will make it possible for you to share your station weather data with your family and friends. This way, they’ll see the kind of weather you’re enjoying while out there. A weather forecasting feature is great too! You can look for a station that calculates the weather trends and generates a forecast based on the collected data. A forecast will then warn you of the coming weather conditions and help you get prepared in advance. Whatever weather station you choose for your recreational vehicle or campervan, make sure it comes with most or all of the above mentioned features and functionalities. What Type Do You Need If You Are a Farmer? It doesn’t matter the size of your farm; a weather station can draw the line between success and failure of your farming efforts. It’ll offer you real-time info on weather conditions to help you know what the right time to conduct what activity is. 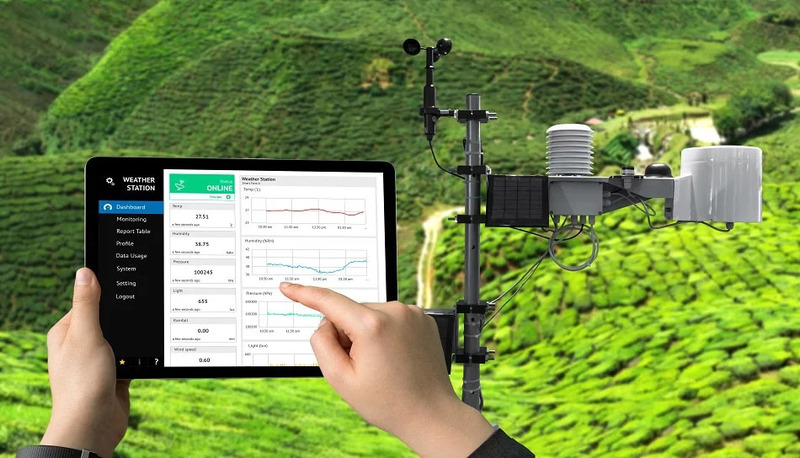 So, which weather station is ideal for your farm? According to my sister who’s a farmer, there’s no specific weather station designed for farmers. Just like the case of the RV above, you can get the right model by simply focusing on the most helpful features for your farm. One such feature revolves around a station with all the basic weather instruments. Such a weather station will keep you updated with all the basic weather conditions like temperature, rainfall, humidity, etc., easily. “Depending on your farm setup, you may also need to look for a weather station with additional functions,” explains Olivia. You’d also want to look for a station that displays leaf moisture data, UV and solar radiation, transpiration, evaporation, etc. Another important thing I’d like to advise all the serious farmers is to look for an expandable weather station model. Why? This is because your farm will grow in future and you might need to upgrade your station as well as to suit your changing needs. On top of all this, you should ensure the model you pick produces quality and reliable resources. DON’T just use your weather station to get real-time weather station updates. Instead, use the data it provides you with for a period of time to understand the weather patterns around your farm. You’ll agree with me that with good knowledge of the weather patterns, you’ll be in a better position to know the best for planting certain crops without experiencing cropping failure. You’ll know when to irrigate your crops. You might even want to compare your farm data with other farmers around your area to help you make even more decisions that will make you a prosperous farmer! 1. How accurate is a home-based weather station? Yes, a home based weather station will provide with accurate weather forecast provided you do your research well and buy the best-quality model. Besides, you’ll need to ensure correct placement of your station for improved accuracy. Other factors such as sensor wires condition and presence of debris in your station housing can also affect its overall accuracy. The type of climate around your home can also affect the accuracy of your station. For instance, daytime rainfall and air temperature readings might record higher than the average in the warmer climates. 2. Does a weather station require any maintenance? Usually, a weather station does not require any form of maintenance. It’s one of those systems that you install and enjoys years of maintenance-free service. You might encounter disruptions of the connection between the station and your console/monitor. In such cases, you’ll need to replace the cables (for wired models) or repair the connection (for wireless models). The software responsible for handling data between the station sensors and processors might also crush, requiring you to perform a firmware upgrade or simply a hard reboot. In case you’re using a wired station, you’d also want to keep inspecting the wire, probably once every month, to ensure they’ve no damages. 3. Where should I install my weather station? The location you install your home weather station is quite essential to ensure you get 100% accurate weather reports. Follow this installation guide on how to decide the best place for setting up your station for the most accurate readings. You might also want to consult your user manual for more info on the installation of your weather station. 4. How much does a weather station cost? The cost of a weather station varies from one model to the other. That said, you can expect to get a decent model going for around USD 150-200. If you’re well off financially, you can also get a mid-range model that goes for approximately USD 300-400. And if you’ve money to spend and want to enjoy all the features and functions of high-end weather stations, you should get ready to spend up to USD 1000 or more. I always recommend my readers to begin their shopping process by determining how much money they’re willing to spend on a weather station and then start their search from there. 5. Will my weather station withstand harsh weather conditions? The manufacturers of these weather stations already understand that the systems will face harsh weather conditions. So, if you get a well-designed, high-quality model, you can rest assured that it’ll hold up to the damaging effects of rain, wind, soil, etc. However, some system will require you to offer them some extra protection in order to withstand these conditions. Be sure you get a quality model designed using durable materials to ensure it does get damaged easily and can save you for a longer period. 6. Can I install a weather station on my own? Sure! The process of installing a weather station is quite easy, and you can do it on your own from start to finish. This is even truer if you go for a wireless model as it’s much easier and quicker to install. Just ensure you follow the owner manual on the correct installation and placement of your weather station to ensure you end up with a fully functional station. We’ve come to the end of our best weather station exhaustive guide. I’m confident that now you’ve got all the critical information you need to help you choose the most suitable weather station for you. You also know the pitfalls to avoid when making a purchase. You should have a clear picture of what you intend to use your new station for, type of data you wish to collect, and the type of weather station that matches your needs and interests. Just like in any other product, you’ll also need to come up with a budget to help you narrow down your choices. If your finances aren’t right, I recommend you to buy one of the 13 affordable models I’ve reviewed for you above. I can guarantee that the 13 weather stations will offer you most of the top-end features and functions with your small budget and meet all your weather monitoring needs.